When I was a kid, my dad owned a convenience store. Every year he took me to a candy convention – a huge room filled with vendors all trying to sell the latest in pop rocks, plastic lips, frozen sodas, and gummies shaped like burgers. By the time we’d gone through every aisle, I had a bag bulging with things made solely of high fructose corn syrup, and my teeth hurt from so much sugar and chocolate. It was every kid’s dream. As a grownup, I found my own version of the candy convention: the National Council of Teachers of English’s (NCTE) annual conference. This is four days of workshops; mingling with educators, writers, and publishers; and attending book signings. And if you partake in the book signings, you not only get to meet your favorite authors, but they give you the books for free. What the candy convention was for sugar lovers, the NCTE is for book lovers. 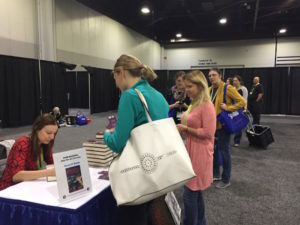 This November, as a debut author, my publisher invited me to do a book signing at the conference. It was an amazing and humbling experience – Ransom Riggs (Miss Peregrine’s Home for Peculiar Children) and Chris Grabenstein (Escape From Mr. Lemoncello’s Library) also had signings. And Nick Bruel (author of the Bad Kitty! series) stopped by my booth, where we chatted for a good thirty minutes. It was an honor to be included with such accomplished, successful authors. And exciting to see them! I stood in more than a few long lines to get books signed. I was also glad to see so many educators, enthusiastic about books and the prospect of choosing curricula for their students. Everyone seemed to get so much out of this rich experience, and that’s wonderful – ultimately, it benefits the kids, and that’s what matters. 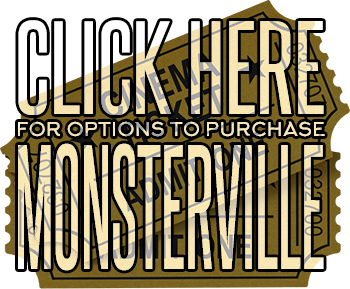 *My book, Monsterville: A Lissa Black Production, is JUMANJI meets GOONIES, a fast-paced adventure where board games come alive and winning your life depends on applying monster movie rules of survival. 13-year-old film-obsessed Lissa discovers a shape-shifting monster in her woods and decides to film the greatest horror movie of all time…until her little sister is kidnapped to the monster homeland of Down Below and she needs her star’s help to rescue her. You can find it on Amazon and online/in stores at Barnes and Noble. My signing at Skyhorse’s booth at NCTE 2017! 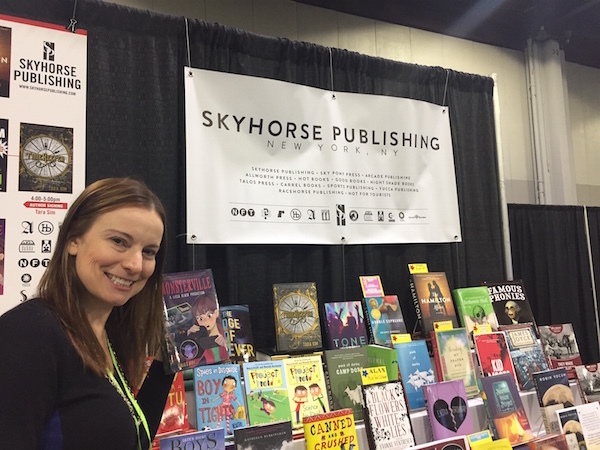 The Skyhorse booth at NCTE 2017!